I'm closing out July with some testing of a Questar focal reducer. I was very disappointed to have my grandchildren leave for home today and miss out on last night's sky. 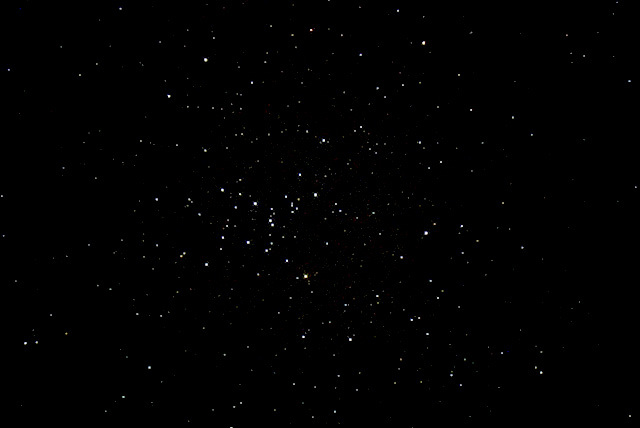 The Ptolemy Cluster in Scorpius was known to the Greeks and the first written record of it comes from, you guessed it, Ptolemy. It is about 3rd magnitude near Scorpio's stinger, so it is easy to find in dark skies. Under Austin urban skies, I pointed the reflex sight to about the right spot and it popped right into view with the AR102. I had problems with the Questar which was on a shorter tripod. At first I thought the fence was in the way, but then I remembered that the Questar fork base gets in the way of the finder for objects low in the south. All was fine in the Questar telescope view. I shot images both with and without the reducer. I'll be processing over the next few days. This preview image is just a stretched JPEG from the Sony live view remote app on my iPhone. This preview is from a single image with the focal reducer in place. It was dim in the iPhone display but with a little curve stretching in Photoshop it looks decent. The HQ full resolution version will come later after staking and dark subtraction. I discovered that I'd missed the image sidebar menus with my search optimizations. The result is that site searches with image results will have extra, low quality, search results. I've fixed the bug, but it will take a few days for Google to re-index the pages. The site remains busy with visitors and Google continues to report average page load times below a half second. I want to thank everyone for their continued encouragement and complements on the site!